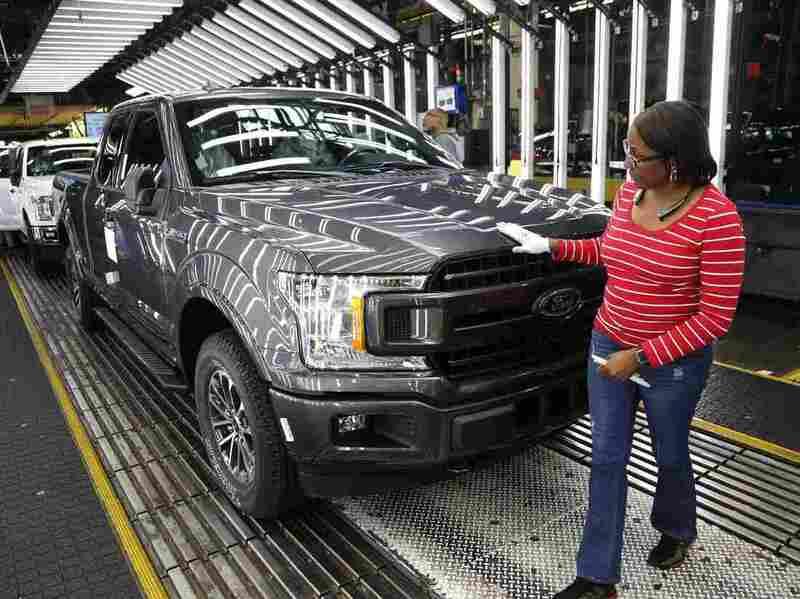 Worker Kelly Coman inspects an F-150 pickup on the assembly line at a Ford plant in Dearborn, Mich. Some indicators point to a slowdown in manufacturing, but the sector added 32,000 jobs in December. The markets have been a mess, but companies are still hiring — a lot. The economy ended the year by adding a much-stronger-than-expected 312,000 jobs in December — the biggest gain in 10 months, the Labor Department said Friday. Meanwhile, the unemployment rate jumped to 3.9 percent — the highest rate since August — as more people felt confident enough to quit their jobs and look for new ones. Major stock market indexes, which have seen massive swings in recent weeks, rebounded Friday morning after the labor report was released. And they surged even more after Federal Reserve Chairman Jerome Powell indicated the central bank was in no hurry to raise interest rates further. "There is no preset path for policy and particularly with the muted inflation readings that we've seen coming in, we will be patient as we watch to see how the economy evolves," Powell said at the American Economic Association's annual meeting in Atlanta. The Dow Jones Industrial Average closed up 746 points, or about 3.3 percent, after plunging 660 points on Thursday. Private analysts had projected that jobs would grow by about 180,000 and that unemployment would stay at November's rate of 3.7 percent. Wage growth also picked up. Average hourly earnings grew 3.2 percent over the past 12 months — topping the 3.1 percent increase in November. Average earnings climbed to $27.48 an hour. Several sectors saw a pickup in hiring. Manufacturing jobs grew by 32,000 last month, construction climbed 38,000, retail was up nearly 24,000, health care rose nearly 58,000, and leisure and hospitality jumped 55,000. In a signal of even more strength, 58,000 more jobs overall were added in the prior two months than previously reported. That boosted job gains to an average 254,000 per month over the last three months. The markets have been turbulent amid concerns that the U.S. economy will be hurt by weakness in other countries. This week, Apple cut its revenue estimates by billions of dollars, primarily because of weaker-than-expected iPhone sales in China due to that country's economic slowdown. Apple CEO Tim Cook said China's growth was hurt by "rising trade tensions with the United States." The ripple effects from slower growth overseas could eventually hurt the U.S. economy, David Dollar, a senior fellow at the Brookings Institution, told NPR's Scott Horsley. "We're living in a world where if China seriously slows down, that's going to have a big effect on literally more than a hundred different economies," Dollar said. "And then, of course, that affects the whole world." Apple's downbeat announcement sent its stock plunging 10 percent Thursday, but it was up nearly 2 percent Friday morning. In the U.S., consumers did not hold back this holiday season, with sales up 5.1 percent over last year, according to a Mastercard report. Still, consumer confidence slid in December, the Conference Board said. "Expectations regarding job prospects and business conditions weakened, but still suggest that the economy will continue expanding at a solid pace in the short-term," said Lynn Franco, a senior director at the Conference Board. Other indicators pointed to a slowdown in the manufacturing sector. The ISM manufacturing index fell 5.2 percentage points in December and an index measuring new orders tumbled 11 percentage points. The big unknown is the partial federal government shutdown. Depending on how long it lasts, the shutdown "could be a big negative" in next month's jobs report, which will reflect January employment, Kevin Hassett, a top economic adviser to President Trump, said Thursday. But Hassett emphasized that the hundreds of thousands of furloughed federal workers will eventually receive back pay, diminishing the shutdown's negative economic impact. The economy grew at a 3.4 percent rate in the third quarter of 2018. The next GDP report, for the fourth quarter, is due Jan. 30. "We know that this economic expansion is likely in its closing acts," says Mark Hamrick, senior economic analyst at Bankrate.com. "What we don't know is how many more acts there are yet to come." NPR's Emily Sullivan contributed to this report.